One of the easiest excuses for not getting to the gym is the old, “I’m too busy” excuse. And it’s a legitimate excuse, if you’re into excuses. 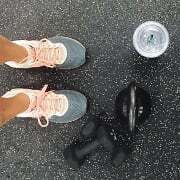 In today’s busy world where people are multitasking like never before, and cramming as much as they can into a work day, we have to actively make time to work out. It doesn’t just happen. Here is a simple guide to carving an extra 30 minutes out of your day to spend at the gym. Wake up earlier: This is the hardest thing for people to imagine doing, but after a few weeks, you may actually enjoy getting your workout done first thing in the morning. Most people who work out first thing in the morning eat better throughout the day, and tend to have more success losing weight, and reaching their fitness goals. It seems that making fitness a priority, and checking it off your list first thing in the morning, sets the tone for the entire day. Eat at your desk: If you’re chained to your desk during the work day, try eating a few smaller meals throughout the morning, and using your lunch break to get sweaty. Keep a gym bag stocked with wet wipes and deodorant so you can simply towel off, freshen up, and get back to work. An hour long lunch break is plenty of time to go get a solid 1/2 hour workout in. Try training with high intensity intervals to get the most bang for your buck. Skip lunch and get off early: If your work environment is flexible, you may be able to work through lunch and get off an hour early. Some offices will allow employees to manage their schedule in this way, and it’s a great way to get your time in at the gym before you have to go home in the afternoon. It’s easy to make good decisions at the dinner table after working out when you certainly don’t want to counteract all that hard work you just put in. Turn off the TV: The average american family is still spending too much time in front of the TV. Make fitness a priority in your family, and after a light dinner, haul the whole family off to the gym. Or head outside for a hike, or walk. Grab Fido and run him around the neighborhood. As a bonus, children who grow up in families that value exercise naturally mature into fitness-minded adults, so you’re not just taking care of yourself here. It’s not enough to simply hope that your day will have enough excess time to spend nurturing your health. Your fitness levels are a direct result of the effort you put into showing up. Consciously making the time to care for yourself, and focusing on your fitness, can be the hardest part of any exercise routine. Remember that you are worth it though, and your time is yours to manage. Make the most of it!